Min Nan (also termed Southern Min) refers to a branch of the Min language, a living Chinese language used since the Tang Dynasty (AD 618–907). Today, Min Nan is commonly spoken in Southern Fujian, Taiwan and by the descendents of Hokkien immigrants in Southeast Asian countries such as Singapore, Malaysia and Indonesia. Embark on a melodious journey with the City Chinese Orchestra (CCO) that explores the music of the Min Nan people, from traditional nanyin music, to popular folk songs and orchestral works inspired by the Hokkien diaspora in Taiwan, Southeast Asia and beyond. 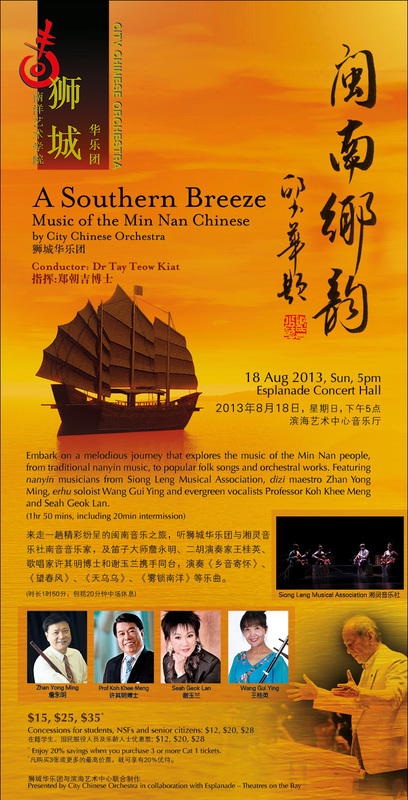 Joining the orchestra in this concert will be nanyin musicians from the Siong Leng Musical Association, dizi (flute) maestro Zhan Yong Ming, erhu (fiddle) soloist Wang Gui Ying and evergreen vocalists Professor Koh Khee Meng and Seah Geok Lan. Led by Conductor and Cultural Medallion recipient, Dr Tay Teow Kiat, the orchestra will also premiere two compositions: Celebration in the Lion City《欢乐的狮城》 by Taiwan-based composer Lu Liang Hui and Min Nan: A Musical Portrait《闽南音画》by resident composer Li Chong Wang. Formerly the Singapore Broadcasting Corporation Chinese Orchestra, City Chinese Orchestra was formed in 1974 and since then has contributed significantly to the popularity of Chinese orchestral music in Singapore. The orchestra now has a repertoire of more than 1,000 compositions and is highly regarded both locally and abroad.